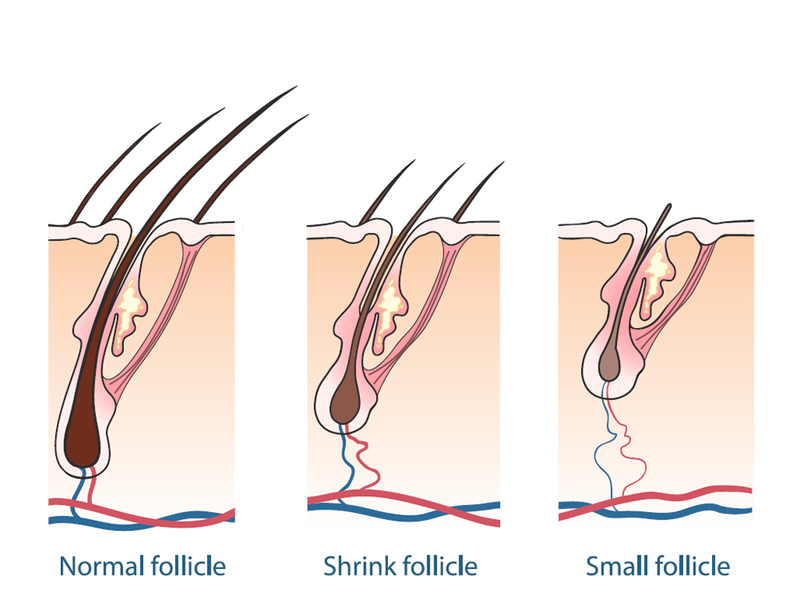 Hair grows from follicles in the dermis of the skin. Scalp hair grows as natural “bundles” containing between one and four hairs each. At the base of each follicle is the papilla, which is surrounded by nerves and blood vessels that maintain hair growth. Surrounding the papilla is the bulb, with actively growing cells that make new hair. Hair is made of a fibrous protein, keratin– the same protein that is found in the skin and the nails. Hair can look healthy, strong and shiny or dull and dead. Dieting on a very low protein diet may result in fragile hair that is lifeless. Problems with the thyroid gland, aging, and over-treatment by chemicals and heat also lead to that dull hair appearance. There is no hair product that can feed or nourish your hair. Humans grow two types of hair: vellus and terminal. Vellus hair is short, fine, and not pigmented. It can be found over much of the body. Terminal hair is found on the scalp and in areas of secondary sexual development. Normal growth for the hair on our scalps is approximately one centimeter (a little less than half an inch) per month. Hormones generally regulate hair growth. Hair loss (alopecia) and excessive hair growth (hirsutism) can be caused by hormonal problems. The most common cause of premature hair loss is pattern baldness, a trait frequently seen in men due to the influence of the hormone testosterone. The hair on the back and sides of the head remains, while causing balding on the front and top. This baldness is hereditary, progressive, and permanent. Typically, the earlier baldness starts in a person’s life, the more extensive it will be. At least half of all men will have some degree of baldness. Pattern baldness also affects women. A Touch of Hair provides state-of- the art hair replacement the most advanced technology available today.